BioWare has been hooking up players with non-player character party members in its games for more than a decade, but there's not been a strictly male-seeking-male option available until Dragon Age Inquisition's Dorian. 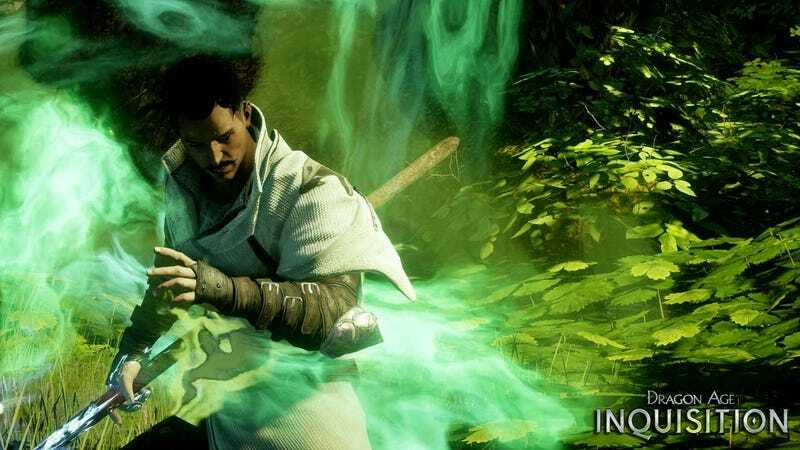 In a character profile recently posted to the Dragon Age Inquisition website (via Eurogamer), writer David Gaider discussed the sexuality of the outcast mage of the Tevinter Imperium, who'll be joining the player's quest when the third game in the series arrives this October. Dorian is gay—he is, in fact, the first fully gay character I've had the opportunity to write. It added an interesting dimension to his back story, considering he comes from a place where "perfection" is the face that every mage puts on and anything that smacks of deviancy is shameful and meant to be hidden. Dorian's refusal to play along with that façade is seen as stubborn and pointless by his family, which has contributed to his status as a pariah. In a Twitter conversation yesterday, Gaider clarified that the phrase "fully gay" was not meant as a comment on bisexuality. Between the Star Wars: Knights of the Old Republic, Mass Effect and Dragon Age franchises, developer BioWare has developed a reputation for romancing. As soon as a new game is announced, the speculation about who can hook up with who begins. Over the years there have been plenty of hetereosexual and bisexual relationship options presented. 2003's Star Wars: Knights of the Old Republic featured a lesbian romance with the character Juhani (though a bug in early versions allowed players of either gender to woo her). So many choices, but none of them involved a male party member that would only become involved with a male player character. Now we've got Dorian. Thank goodness his hair doesn't always look like that.